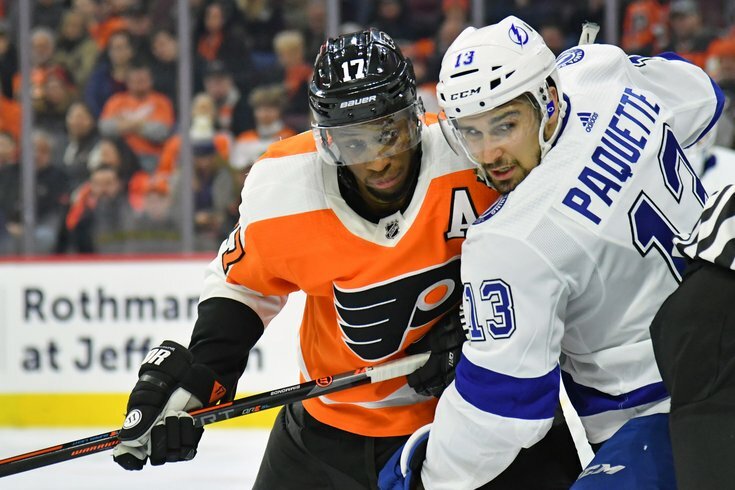 Philadelphia Flyers right wing Wayne Simmonds battles with Tampa Bay Lightning center Cedric Paquette during the second period at Wells Fargo Center. Saturday is a big day for the Flyers. Not only will they play their first-ever game at Lincoln Financial Field; not only will they be facing off against their rivals, the Pittsburgh Penguins; but they will also be in danger of falling even further out of a playoff spot as the season winds down and the NHL Trade Deadline rapidly approaches. And they'll have to play without rookie goalie Carter Hart, who has recently been ruled out for the next 10 days with a lower body injury. Win or lose Saturday night, once the Flyers-Penguins game ends, general manager Chuck Fletcher will have approximately 40 hours to make any of the moves he hopes to make before his first deadline at the helm passes (3 p.m. on Monday). Fletcher has already made a few moves in the weeks leading up to the deadline, but with the Flyers on a hot streak for most of January and early February, climbing from the NHL's cellar to within a few points of a playoff spot, he may have been hesitant to classify his team as deadline sellers. But now, after a few losses, it's clear again that the Flyers are sellers. And their biggest trade chip remains veteran winger Wayne Simmonds, who is playing in the final year of his contract. Friday morning, we mentioned that talks about Simmonds had stalled while the rest of the league waited to see where the Senators dealt Matt Duchene and Mark Stone. The first of those dominos, Duchene, fell Friday afternoon. So will Simmonds be next? Could this be his last game in orange and black? Will he even last until tonight's game at The Linc? Follow along for all the latest NHL trade rumors and news right here in our live updates post.